It was a quiet Thursday, a little more that a week ago, when I was shocked to the point of virtual heart attack! I may not have been so terrified, if I hadn’t been horribly sick with nasty bronchial virus, and I thought that I might be hallucinating. But, I wasn’t. I was startled out of my feverish stupor when my brother-in-law came stumbling into the house with a giant prehistoric creature in his arms. He was screaming, not just with excitement, but with the strain of the ponderous weight he was hefting though the house onto the back porch! Had I been in my right mind, I would have immediately grabbed my camera. But, I was in such shock all I could do was gape at this thing that looked like a large fossilized boulder with 4 spiny legs and a yoda-like face with large blinking reptilian eyes….And it was gaping back at me! Probably in more shock than I was, having been hoisted and joggled into this strange place! It was a 100 lb. 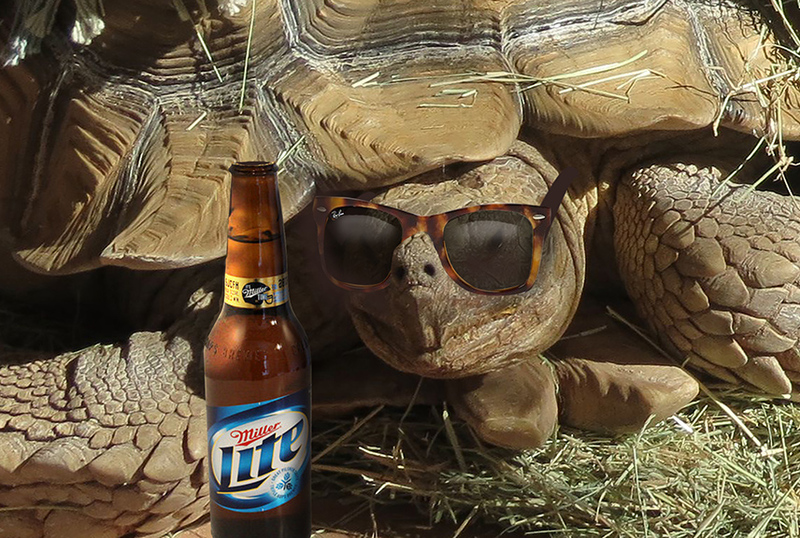 Sulcata Tortoise (African Desert Tortoise)! I had never seen one in real life. We had the opportunity to get a couple of them a few years ago, but with out a fenced yard, it would be hard to contain something like this! The most hilarious part of this little story, was what happened when Todd got home from work. We had not notified him to our new guest and waited anxiously for his reaction….. We sat there like nothing was up for a couple of minutes while Todd recounted his day, when he was distracted by a crash on the corner of the porch where he witnessed the ‘Tortzilla’ plowing over the rock sculpture Todd had so carefully placed there. “WHAT THE F*&%K IS THAT!! !” Todd screamed as he jumped out of his chair!…. Ahhhh….It was priceless…should have got it on video! But who can think when they are sick! Anyway, after an afternoon of speculation about this tortoise titan, I thought I better go on line and see if I could find any posts about a missing tortoise…surely someone must be missing him!! He would not be hard to miss!! But, surprisingly, I didn’t find anything. So we barricaded the porch, found a large box and filled it with hay, fed him all of the vegetables we had in the house, and spent the next few days trying to figure out what to do. Daizy was intrigued, but kept a respectful distance, when there was a hhhhhrunmmmff from gentle giant. Our Cavelier, Baily was totally indifferent. 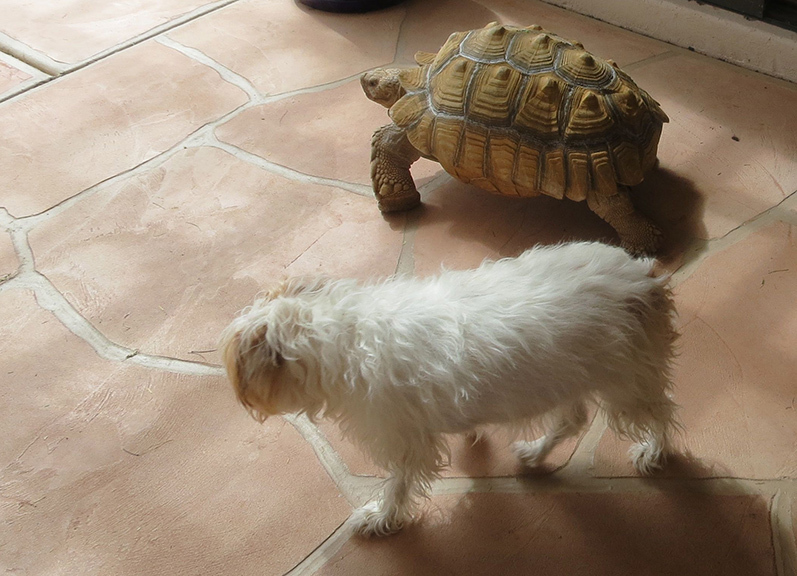 Our Chihuahua, Lulu, was terrified and wouldn’t go near this strange thing. But Bizbee, she was bound determined to make Tortzilla her best friend, even risking her nose by getting all up in his business every chance she got! Tortzilla was extremely patient and gentle. 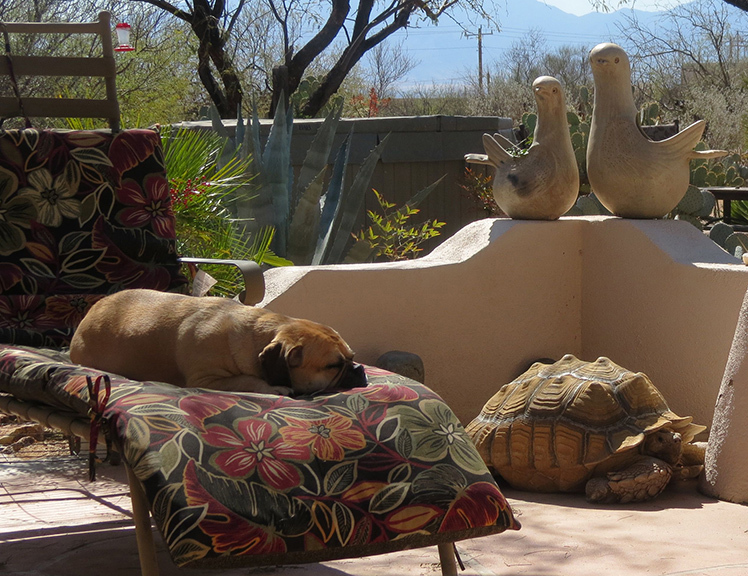 He was fascinated by our baby torti’s when we put them on the porch for their daily sunning session. Although, I’m not sure if he wanted to love them, or eat them! But, the babies were certainly not scared of Tortzilla! But, this is not where the story ends….Sunday morning, I finally found a post on Craigs list- Family Pet, 100 lb. 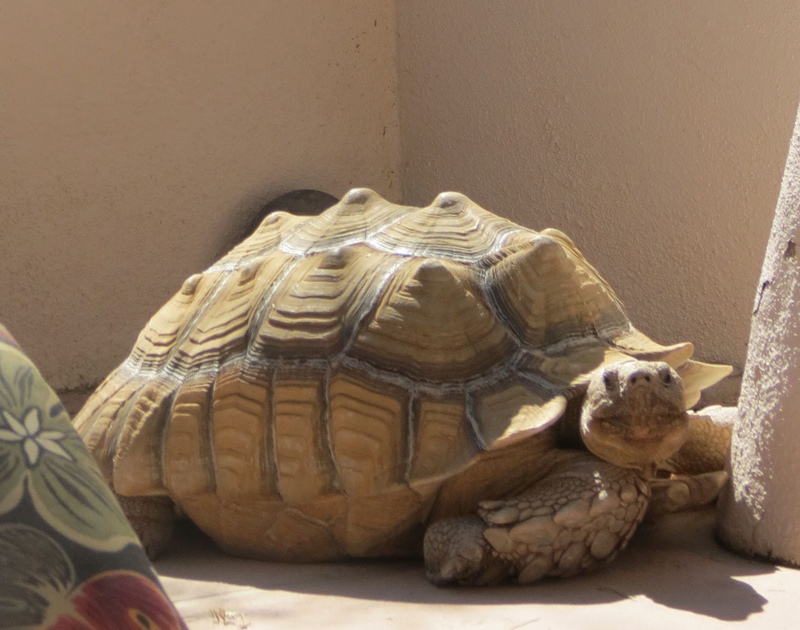 missing Sulcata Tortoise in Sahuarita from a house one street over from ours. 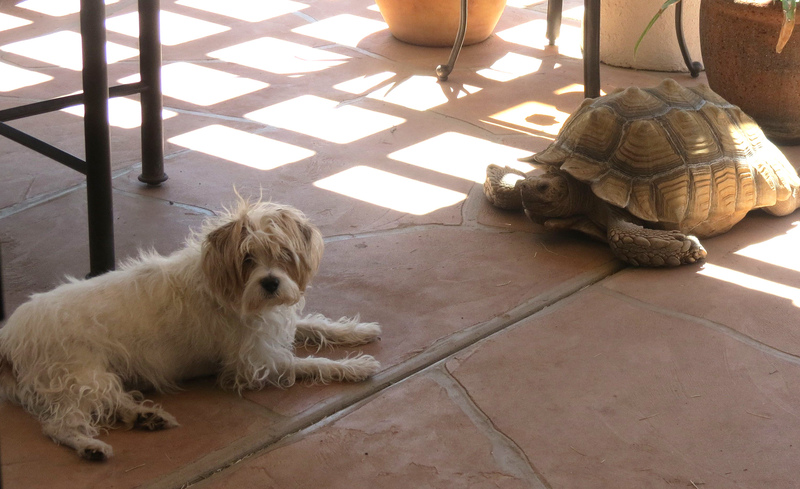 My first thought was ” Well, maybe this isn’t the same Tortoise!” But common sense ruled and I made the call. The Grover family was ecstatic to get their beloved Chester back!! I didn’t ask how he got lost, but I had to know his story….the real story…of this amazing creature! Chester is only 18 years old! He can live to be 100!!! and will probably be twice this size ;0 He has lived with the Grover family for 8 years- they got him from a Reptile Rescue in Tucson. When they got him he was very ill and they nursed him back to health. A great story if I do say so myself! And to the Grover Family….FYI…we really did not feed him beer! 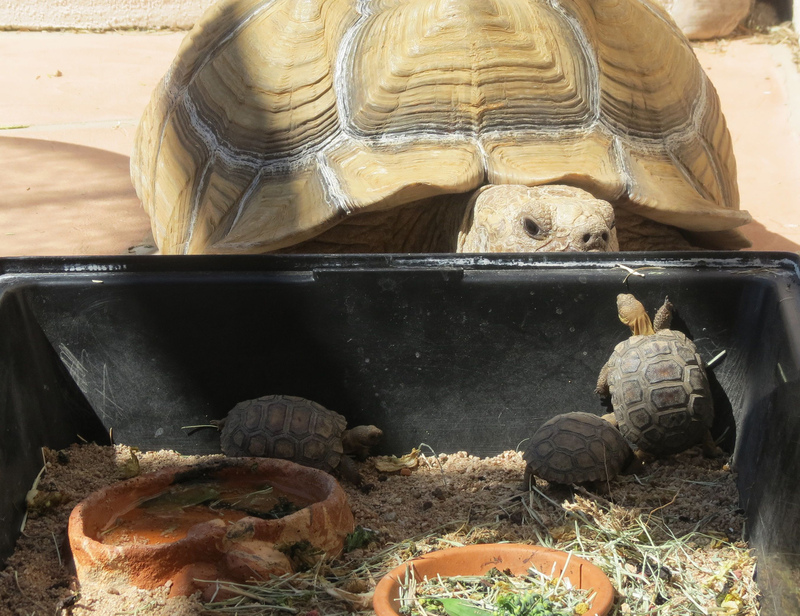 Only the best tortoise healthy foods are served in Todd’s Backyard! Please keep up posted on him!! Great great story! I can see Todd right now…that would have been a great video! Love the sunglasses and beer! Sulcatas can get pretty big, over 150lbs. 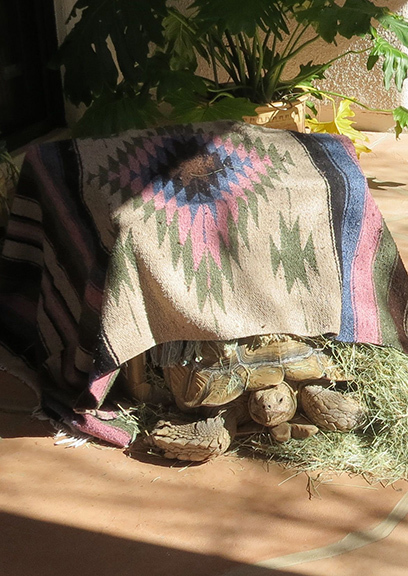 They need more moisture than our desert torts and I don’t think they hibernate. You got baby torts! Are they Gerti’s? How is Gerti these days? Mine came out early, mid February and then again early March. Very warm winter! Great story!!! 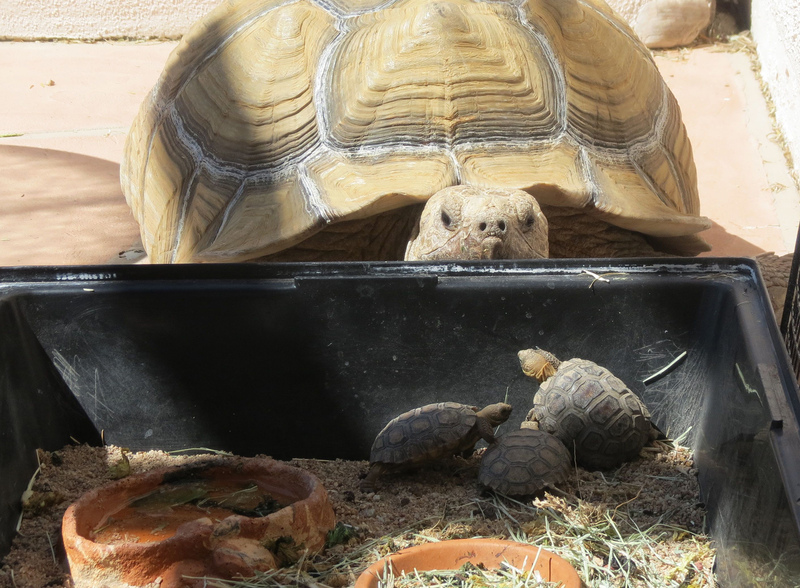 I’ve been a turtle/tortoise mama since 1956… Got to love them!